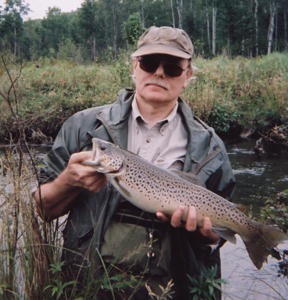 It had been thirty years since Feral, his buddy Jeff and I fished the remote flooding up in the Pigeon River State game area. In my mind at least it started taking on mythical proportions as northern pike water. On that fateful day decades ago we pulled in too many pike to count including some twenty inchers that had obviously been attacked by much larger pike, with teeth gouge marks surrounding their bodies. Feral cleaned up that day with a yellow in-line rooster tail spinner and that meant every third cast he was pulling in the small but abundant pike. We didn’t latch on to one of the monsters prowling the dark water…but there was no doubt they were in there. 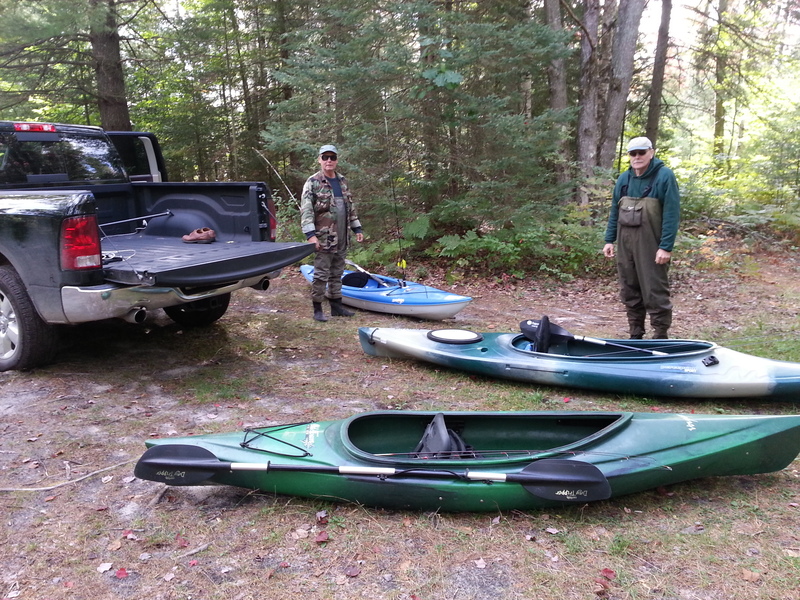 Fast-forward to this fall on annual trout camp closer, this time with kayaks and the means to get back into that remote water. Natch drove. He has a pickup truck designed to haul big things and 3 kayaks in the back was no problem. We stopped at the ranger station to pick up a map – just in case – which was lucky because the road into the flooding was unmarked. Still, we needed a GPS. The road was overgrown and unused. That may have been a good clue. The road, or opening, was just wide enough to get the truck through if the side mirrors were tucked in. The further we went, the tighter it got – so I’ll thank Natch for keeping his cool which is hard to do driving a new truck through a virtual canopy of claw-like branches and blowdowns. There was no turning around once we started: Feral speculated the 3 kayaks sticking up over the rear gate would be like the prongs of a treble hook, so even backing out was out of the question. At the end of the trail we found a clearing and what used to be a channel out into the flooding. 30 years put the flooding another 50 yards out from the landing. 50 yards of floating bog: grass and roots that sunk down with every step – like walking on a carpet laying over a swimming pool. 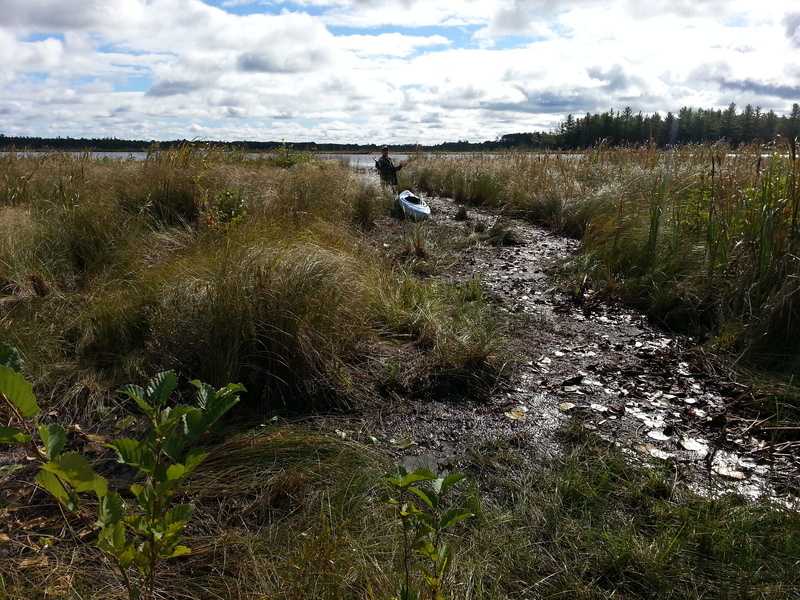 We had to drag the kayaks over the bog and couldn’t help but wonder who would break through and disappear first. 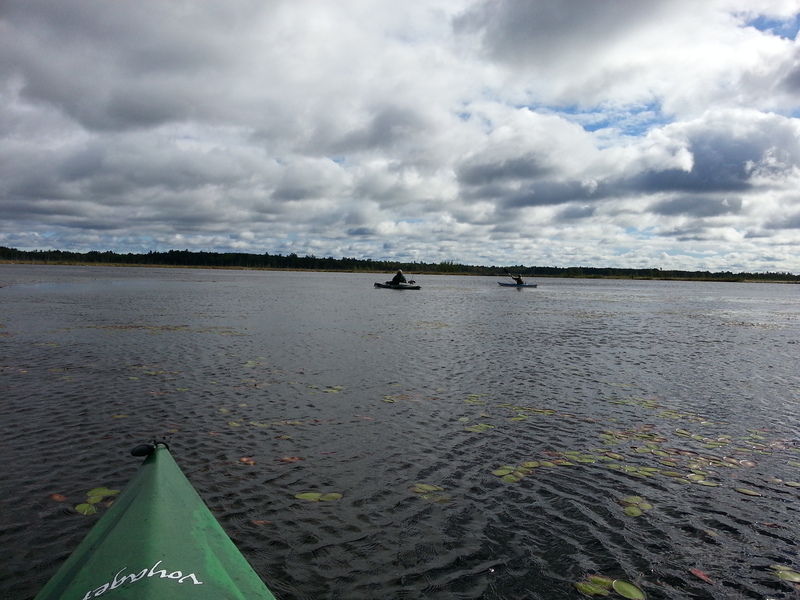 We leaned on the kayaks for stability and dragged them over the clumps of floating grass. Everything in the above photo is floating on water. No telling how deep. 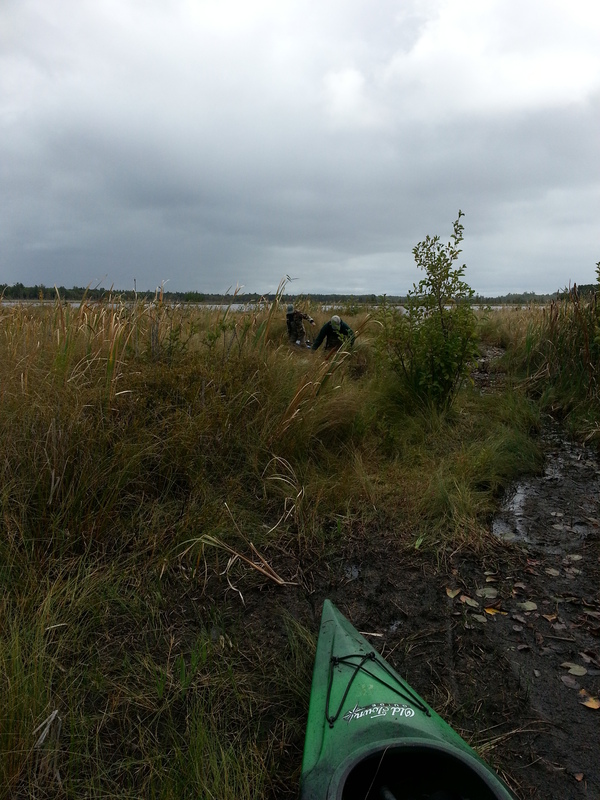 Natch launched last and took this photo as he paddled out into the flooding. (All photos by Natch) Somehow everything looked bigger than I remembered. Maybe it was the vantage point of a kayak versus a rowboat – sitting closer to water level. The wind picked up right away and the temperature nose-dived. Fortunately we were bundled up good with lots of layers so we planned it right. When the sun went behind the clouds it felt like the temp dropped ten degrees in a matter of seconds. I started working the upwind portion of the flooding, in part to avoid wind drift, but could only make a couple casts with a 3/8 ounce white spinner bait and then I was too far from shore. 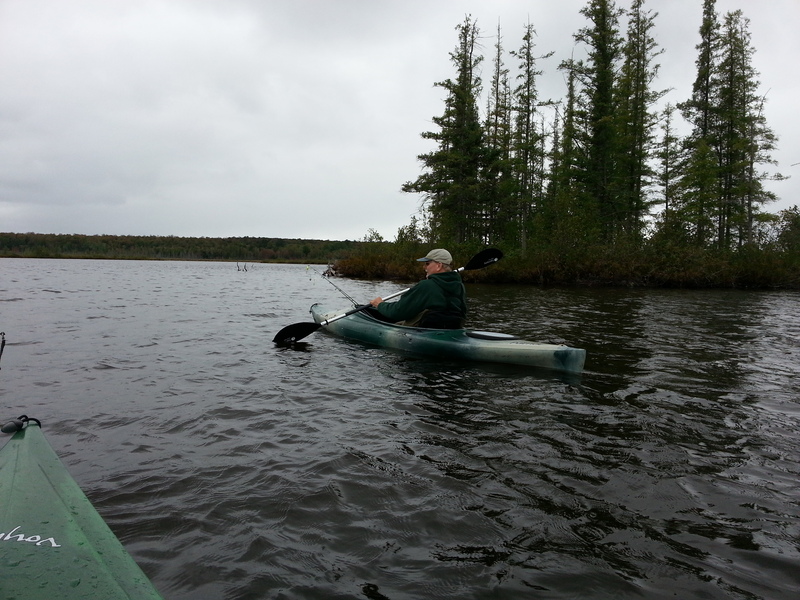 So it was cast, paddle, cast, and I worked myself into a comfortable but fishless rhythm. Natch and Feral did their own exploring and soon we were scattered around the flooding, beyond yelling distance. I expected both of them were hauling in fish so I experimented with lures including a pop-r around some lily pads figuring if there was bass around – that is a pretty good draw. Still, cast after cast – nothing. After an hour I headed to a centrally located island where I saw Natch fishing earlier. We were all thinking the same thing: converge there and see how everyone is doing. First consensus – not so good. The pike were missing. 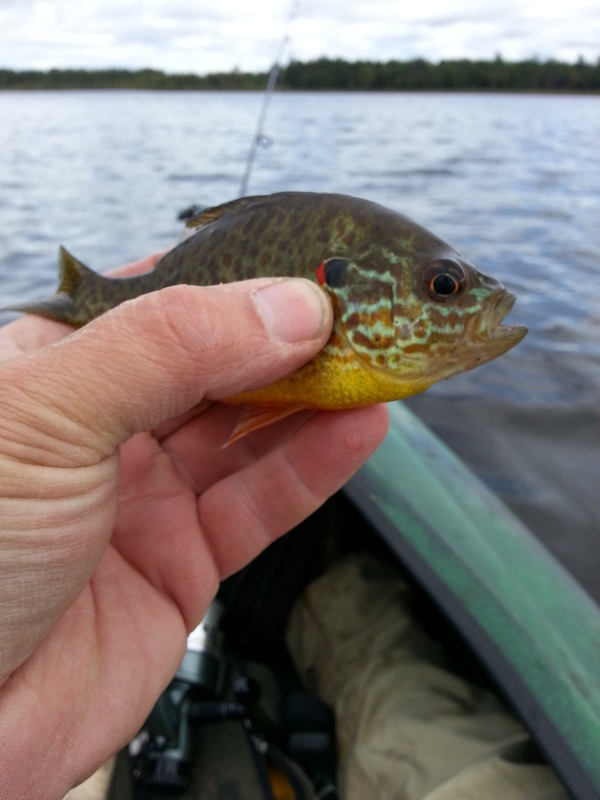 This fish, caught by Natch, confirmed our worst fears: Piranha had eaten all of the pike in Dog Lake Flooding. I expect the pike put up a good battle but it may have come down to attitude. Piranha are vicious. Here, Natch employs the Vulcan Nerve Pinch which subdues all manner of carbon based life forms. We could have switched fishing tactics but not one of us remembered to bring along the rules and regs so the we didn’t know about legal limits or even whether piranha are in season. So we called it a day and headed back to the floating bog mass. I’m happy to report we all made it back to solid ground. We were up for the challenge but I guess you can’t “go back.” 30 years is a long time. I’m going to ask Feral to make a sign for the trailhead: Dog Lake Flooding – Enter at Your Own Risk. A skull and crossbones would do nicely. That is one huge Piranha!!! The ones I catch in Lake county are a lot smaller. If I catch one that big, I will get it stuffed…those buggers are rare! !